The winner of our contest to create a cut & sew kit for a cloth baby book is none other than Bora, clocking in with her 8th Fabric of the Week contest win. Wow! 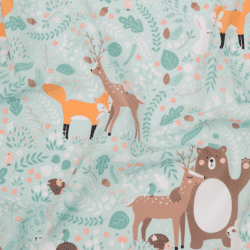 Although the baby book pattern fits onto a fat quarter, as a bonus Bora's entry actually includes three other quarter-yard designs for a bib and a fun set of plush toys. It's a whole yard's worth of great baby presents! The other nine entries in this week's top ten are also adorable. Just remember, if you had it in mind to get any of these patterns before Christmas, you'll have to use the rush shipping option. Bora! 😀 Jeej! Congratulations! 😀 Well deserved win!